Liverpool's new owners Tom Hicks and George Gillett have been asked by city council leaders to look again at sharing their new stadium with Everton. The American tycoons want to make Liverpool's proposed new stadium bigger than the planned 60,000-capacity. Liverpool have always ruled out sharing with Everton but council leader Warren Bradley wants them to reconsider. He told the Liverpool Echo: "If they can consider an increase in size, why can't they consider a shared stadium?" Liverpool have yet to confirm the decision to suspend preparatory work on the £215m project in Stanley Park, but have revealed a review will be undertaken. And Bradley, a Blues season-ticket holder, feels Hicks and Gillette could be persuaded to allow Everton to share the new ground. He added: "They have got their guys (Dallas firm HKS) looking at designs, infrastructure and everything. "Are you telling me a commercial business in America doesn't sweat the asset? They sweat that asset until they can't get any more out of it. Everton are considering moving to a new site outside Liverpool in Kirkby but Bradley also thinks redeveloping their current home Goodison Park should not be ruled out. "I think in a few years' time they'll be playing in a new stadium and I think it will be in Liverpool," Bradley explained. 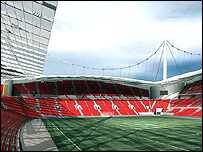 "I would be happy with a joint stadium, I've got to be honest, but my gut feeling is probably not. "I don't see any reason why Goodison Park can't be redeveloped. You could quite easily fit an additional footprint and some commercial activity - a hotel, for example - into a new development."